Antisemitism (also spelled anti-Semitism or anti-semitism) is prejudice against, hatred of, or discrimination against Jews as an ethnic, religious, or racial group. A person who holds such positions is called an antisemite. Antisemitism is widely considered to be a form of racism. While the conjunction of the units anti-, Semite, and -ism indicates antisemitism as being directed against all Semitic people, the term was popularized in Germany in 1873 as a scientific-sounding term for Judenhass (Jew-hatred), although it had been used for at least two decades prior, and that has been its normal use since then. For the purposes of a 2005 U.S. governmental report, antisemitism was considered "hatred toward Jews—individually and as a group—that can be attributed to the Jewish religion and/or ethnicity". Antisemitism may be manifested in many ways, ranging from expressions of hatred of or discrimination against individual Jews to organized violent attacks by mobs, state police, or even military attacks on entire Jewish communities. Although the term did not come into common usage until the 19th century, it is now also applied to historic anti-Jewish incidents. 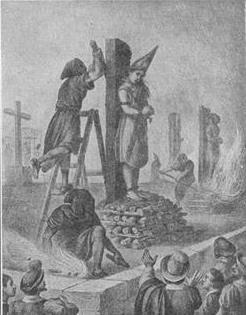 Notable instances of persecution include the pogroms which preceded the First Crusade in 1096, the expulsion from England in 1290, the massacres of Spanish Jews in 1391, the persecutions of the Spanish Inquisition, the expulsion from Spain in 1492, Cossack massacres in Ukraine of 1648–1657, various pogroms in Imperial Russia between 1821 and 1906, the 1894–1906 Dreyfus affair in France, the Holocaust in German-occupied Europe, official Soviet anti-Jewish policies and Arab and Muslim involvement in the Jewish exodus from Arab and Muslim countries. The origin of "antisemitic" terminologies is found in responses of Moritz Steinschneider to the views of Ernest Renan. As Alex Bein writes "The compound anti-Semitism appears to have been used first by Steinschneider, who challenged Renan on account of his 'anti-Semitic prejudices' [i.e., his derogation of the "Semites" as a race]". Avner Falk similarly writes: 'The German word antisemitisch was first used in 1860 by the Austrian Jewish scholar Moritz Steinschneider (1816-1907) in the phrase antisemitische Vorurteile (antisemitic prejudices). Steinschneider used this phrase to characterise the French philosopher Ernest Renan's false ideas about how "Semitic races" were inferior to "Aryan races"'. Pseudoscientific theories concerning race, civilization, and "progress" had become quite widespread in Europe in the second half of the 19th century, especially as Prussian nationalistic historian Heinrich von Treitschke did much to promote this form of racism. He coined the phrase "the Jews are our misfortune" which would later be widely used by Nazis. In Treitschke's writings "Semitic" was synonymous with "Jewish", in contrast to its use by Renan and others. 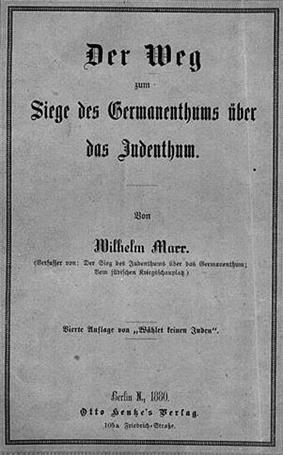 In 1873 German journalist Wilhelm Marr published a pamphlet, Der Sieg des Judenthums über das Germanenthum. Vom nicht confessionellen Standpunkt aus betrachtet (The Victory of the Jewish Spirit over the Germanic Spirit. Observed from a non-religious perspective. )&/or in which he used the word Semitismus interchangeably with the word Judentum to denote both "Jewry" (the Jews as a collective) and "jewishness" (the quality of being Jewish, or the Jewish spirit). The pamphlet became very popular, and in the same year he founded the Antisemiten-Liga (League of Antisemites), the first German organization committed specifically to combating the alleged threat to Germany and German culture posed by the Jews and their influence, and advocating their forced removal from the country. Despite the use of the prefix anti-, the term "anti-Semitic" is not a direct opposite of "Semitic" which linguistically makes the term a misnomer. Within common, day to day usage, however, the terms "anti-Semitism" and "antisemitism" have accepted and specific use to describe prejudice against Jews alone and in general. This is despite the fact that there are other speakers of Semitic languages (e.g. Arabs, Ethiopians, or Assyrians) and that not all Jews speak a Semitic language. The term "antisemitic" has been used on occasion with meanings inclusive of bigotry against other Semitic-language peoples such as Arabs, with the validity of such use being challenged. The terms "anti-Semitism" and "antisemitism" are both in use. Some scholars favor the unhyphenated form because, "If you use the hyphenated form, you consider the words 'Semitism', 'Semite', 'Semitic' as meaningful" whereas "in antisemitic parlance, 'Semites' really stands for Jews, just that." For example, Emil Fackenheim supported the unhyphenated spelling, in order to "[dispel] the notion that there is an entity 'Semitism' which 'anti-Semitism' opposes." Others endorsing an unhyphenated term for the same reason include Padraic O'Hare, professor of Religious and Theological Studies and Director of the Center for the Study of Jewish-Christian-Muslim Relations at Merrimack College; Yehuda Bauer, professor of Holocaust Studies at the Avraham Harman Institute of Contemporary Jewry at the Hebrew University of Jerusalem; and James Carroll, historian and novelist. According to Carroll, who first cites O'Hare and Bauer on "the existence of something called 'Semitism'", "the hyphenated word thus reflects the bipolarity that is at the heart of the problem of antisemitism". For Sonja Weinberg, as distinct from economic and religious Jews conspired to 'judaise' the world; it served to consolidate social identity; it channeled dissatisfactions among victims of the capitalist system; and it was used as a conservative cultural code to fight emancipation and liberalism. There have been a number of efforts by international and governmental bodies to define antisemitism formally. The U.S. Department of State states that "while there is no universally accepted definition, there is a generally clear understanding of what the term encompasses." For the purposes of its 2005 Report on Global Anti-Semitism, the term was considered to mean "hatred toward Jews—individually and as a group—that can be attributed to the Jewish religion and/or ethnicity." In 2005, the European Monitoring Centre on Racism and Xenophobia (now Fundamental Rights Agency), then an agency of the European Union, developed a more detailed working definition, which states: "Antisemitism is a certain perception of Jews, which may be expressed as hatred toward Jews. Rhetorical and physical manifestations of antisemitism are directed toward Jewish or non-Jewish individuals and/or their property, toward Jewish community institutions and religious facilities." It also adds that "such manifestations could also target the state of Israel, conceived as a Jewish collectivity," but that "criticism of Israel similar to that leveled against any other country cannot be regarded as antisemitic." It provides contemporary examples of ways in which antisemitism may manifest itself, including: promoting the harming of Jews in the name of an ideology or religion; promoting negative stereotypes of Jews; holding Jews collectively responsible for the actions of an individual Jewish person or group; denying the Holocaust or accusing Jews or Israel of exaggerating it; and accusing Jews of dual loyalty or a greater allegiance to Israel than their own country. It also lists ways in which attacking Israel could be antisemitic, and states that denying the Jewish people their right to self-determination, e.g. by claiming that the existence of a state of Israel is a racist endeavor, can be a manifestation of antisemitism—as can applying double standards by requiring of Israel a behavior not expected or demanded of any other democratic nation, or holding Jews collectively responsible for actions of the State of Israel. Late in 2013, the definition was removed from the website of the Fundamental Rights Agency. A spokesperson said that it had never been regarded as official and that the agency did not intend to develop its own definition. 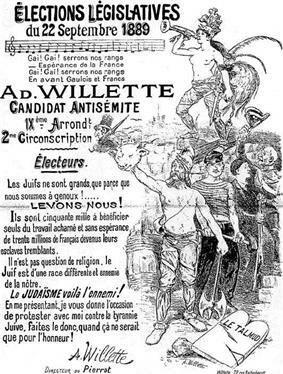 In 1879, World War II, when animosity towards Jews was far more commonplace, it was not uncommon for a person, organization, or political party to self-identify as an antisemite or antisemitic. After the 1945 victory of the Allies over Nazi Germany, and particularly after the extent of the Nazi genocide of Jews became known, the term "anti-Semitism" acquired pejorative connotations. This marked a full circle shift in usage, from an era just decades earlier when "Jew" was used as a pejorative term. Yehuda Bauer wrote in 1984: "There are no anti-Semites in the world... Nobody says, 'I am anti-Semitic.' You cannot, after Hitler. The word has gone out of fashion." Gustavo Perednik has argued that what he terms "Judeophobia" has a number of unique traits which set it apart from other forms of racism, including permanence, depth, obsessiveness, irrationality, endurance, ubiquity, and danger. He also wrote in his book Spain Derailed that "The Jews were accused by the nationalists of being the creators of Communism; by the Communists of ruling Capitalism. If they live in non-Jewish countries, they are accused of double-loyalties; if they live in the Jewish country, of being racists. When they spend their money, they are reproached for being ostentatious; when they don't spend their money, of being avaricious. They are called rootless cosmopolitans or hardened chauvinists. If they assimilate, they are accused of fifth-columnists, if they don't, of shutting themselves away." Louis Harap defines cultural antisemitism as "that species of anti-Semitism that charges the Jews with corrupting a given culture and attempting to supplant or succeeding in supplanting the preferred culture with a uniform, crude, "Jewish" culture. Similarly, Eric Kandel characterizes cultural antisemitism as being based on the idea of "Jewishness" as a "religious or cultural tradition that is acquired through learning, through distinctive traditions and education." According to Kandel, this form of antisemitism views Jews as possessing "unattractive psychological and social characteristics that are acquired through acculturation." Niewyk and Nicosia characterize cultural antisemitism as focusing on and condemning "the Jews' aloofness from the societies in which they live." An important feature of cultural antisemitism is that it considers the negative attributes of Judaism to be redeemable by education or religious conversion. 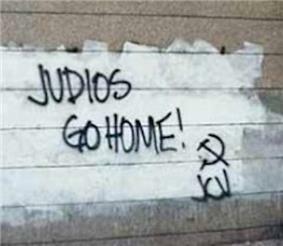 Although the origins of antisemitism are rooted in the Judeo-Christian conflict, religious antisemitism, other forms of antisemitism have developed in modern times. Frederick Schweitzer asserts that, "most scholars ignore the Christian foundation on which the modern antisemitic edifice rests and invoke political antisemitism, cultural antisemitism, racism or racial antisemitism, economic antisemitism and the like." William Nichols draws a distinction between religious antisemitism and modern antisemitism based on racial or ethnic grounds: "The dividing line was the possibility of effective conversion... a Jew ceased to be a Jew upon baptism." From the perspective of racial antisemitism, however, "... the assimilated Jew was still a Jew, even after baptism.... From the Enlightenment onward, it is no longer possible to draw clear lines of distinction between religious and racial forms of hostility towards Jews... Once Jews have been emancipated and secular thinking makes its appearance, without leaving behind the old Christian hostility towards Jews, the new term antisemitism becomes almost unavoidable, even before explicitly racist doctrines appear." Zoological conspiracy theories have been propagated by the Arab media and Arabic language websites, alleging a "Zionist plot" behind the use of animals to attack civilians or to conduct espionage. Starting in the 1990s, some scholars have advanced the concept of new antisemitism, coming simultaneously from the Left-wing politics, the Right-wing politics, and radical Islam, which tends to focus on opposition to the creation of a Jewish homeland in the State of Israel, and they argue that the language of anti-Zionism and criticism of Israel are used to attack Jews more broadly. In this view, the proponents of the new concept believe that criticisms of Israel and Zionism are often disproportionate in degree and unique in kind, and they attribute this to antisemitism. Jewish scholar Gustavo Perednik has posited that anti-Zionism in itself represents a form of discrimination against Jews, in that it singles out Jewish national aspirations as an illegitimate and racist endeavor, and "proposes actions that would result in the death of millions of Jews". 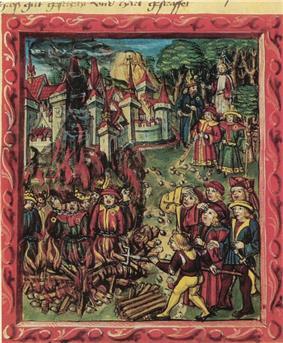 It is asserted that the new antisemitism deploys traditional antisemitic motifs, including older motifs such as the blood libel. 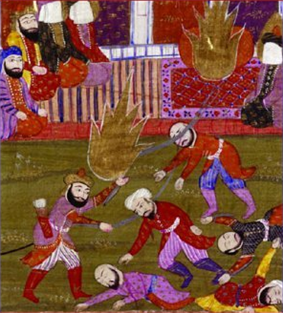 From the 9th century CE, the medieval Islamic world classified Jews (and Christians) as dhimmi, and allowed Jews to practice their religion more freely than they could do in medieval Christian Europe. Under Islamic rule, there was a Golden age of Jewish culture in Spain that lasted until at least the 11th century. It ended when several Muslim pogroms against Jews took place on the Iberian Peninsula, including those that occurred in Córdoba in 1011 and in Granada in 1066. Several decrees ordering the destruction of synagogues were also enacted in Egypt, Syria, Iraq and Yemen from the 11th century. In addition, Jews were forced to convert to Islam or face death in some parts of Yemen, Morocco and Baghdad several times between the 12th and 18th centuries. The Almohads, who had taken control of the Almoravids' Maghribi and Andalusian territories by 1147, were far more fundamentalist in outlook compared to their predecessors, and they treated the dhimmis harshly. Faced with the choice of either death or conversion, many Jews and Christians emigrated. Some, such as the family of Maimonides, fled east to more tolerant Muslim lands, while some others went northward to settle in the growing Christian kingdoms. In 1850 the German composer Richard Wagner published Das Judenthum in der Musik ("Jewishness in Music") under a pseudonym in the Neue Zeitschrift für Musik. The essay began as an attack on Jewish composers, particularly Wagner's contemporaries (and rivals) Felix Mendelssohn and Giacomo Meyerbeer, but expanded to accuse Jews of being a harmful and alien element in German culture. Antisemitism can also be found in many of the Grimms' Fairy Tales by Jacob and Wilhelm Grimm, published from 1812 to 1857. It is mainly characterized by Jews being the villain of a story, such as in "The Good Bargain (Der gute Handel)" and "The Jew Among Thorns (Der Jude im Dorn)." Some scholars view Karl Marx's essay On The Jewish Question as antisemitic, and argue that he often used antisemitic epithets in his published and private writings. These scholars argue that Marx equated Judaism with capitalism in his essay, helping to spread that idea. Some further argue that the essay influenced National Socialist, as well as Soviet and Arab antisemites. Marx himself had Jewish ancestry, and Albert Lindemann and Hyam Maccoby have suggested that he was embarrassed by it. Others argue that Marx consistently supported Prussian Jewish communities' struggles to achieve equal political rights. These scholars argue that "On the Jewish Question" is a critique of Bruno Bauer's arguments that Jews must convert to Christianity before being emancipated, and is more generally a critique of liberal rights discourses and capitalism. David McLellan and Francis Wheen argue that readers should interpret On the Jewish Question in the deeper context of Marx's debates with Bruno Bauer, author of The Jewish Question, about Jewish emancipation in Germany. According to McLellan, Marx used the word Judentum colloquially, as meaning commerce, arguing that Germans must be emancipated from the capitalist mode of production not Judaism or Jews in particular. "Contemporary Global Anti-Semitism: A Report Provided to the United States Congress" PDF (7.4 MB), United States Department of State, 2008. Retrieved 25 November 2010. See html version. Judeophobia: A short course on the history of anti-Semitism at  Zionism and Israel Information Center. ^ a b anti-Semitism – Definition and More from the Merriam-Webster Dictionary. Retrieved 2 June 2012. Antisemitism is more commonly used than "religious antisemitism" or "anti-Judaism." 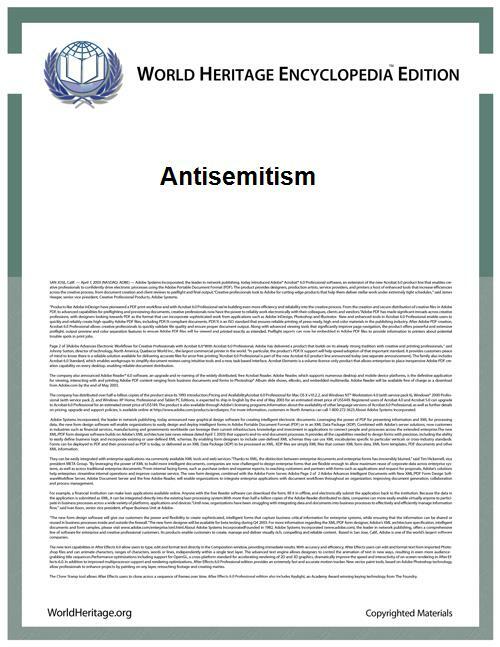 The Encyclopædia Britannica, for example, defines "antisemitism" to include religious antisemitism: "hostility toward or discrimination against Jews as a religious, ethnic, or racial group." ("Anti-Semitism", Encyclopædia Britannica, 2006.) Also see "Anti-Semitism", Merriam-Webster Dictionary. ^ United Nations General Assembly Session 53 Resolution 133. A/RES/53/133 Measures to combat contemporary forms of racism, racial discrimination, xenophobia and related intolerance page 4. 1 March 1999. Rattansi, Ali. Racism: A Very Short Introduction, Oxford University Press, 2007, pp. 4–5. Rubenstein, Richard L.; Roth, John K. Approaches to Auschwitz: the Holocaust and its legacy, Westminster John Knox Press, 2003, p. 30. Johnston, William M. The Austrian Mind: An Intellectual and Social History, 1848–1938, University of California Press, 1983, p. 27. Lewis, Bernard. "Semites and Antisemites". Extract from Islam in History: Ideas, Men and Events in the Middle East, The Library Press, 1973. broken link, page?, quote? "Anti-Semitism", Encyclopædia Britannica, 2006. quote? ^ a b "Report on Global Anti-Semitism", U.S. State Department, 5 January 2005. ^ Matas, David. Aftershock: Anti-Zionism and Antisemitism, Dundurn Press, 2005, p. 34. ^ Almog, Shmuel. "What's in a Hyphen? ", SICSA Report: Newsletter of the Vidal Sassoon International Center for the Study of Antisemitism (Summer 1989). ^ Bauer, Yehuda. A History of the Holocaust, Franklin Watts, 1982, p. 52. ISBN 0-531-05641-4. ^ cited in Sonja Weinberg, Pogroms and Riots: German Press Responses to Anti-Jewish Violence in Germany and Russia, (1881–1882), Peter Lang, 2010 p. 18. 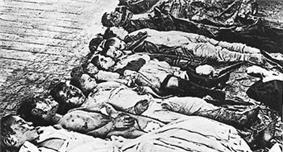 ^ Sonja Weinberg, Pogroms and Riots: German Press Responses to Anti-Jewish Violence in Germany and Russia, (1881–1882), pp. 18–19. ^ Lewis, Bernard. "The New Anti-Semitism", The American Scholar, Volume 75 No. 1, Winter 2006, pp. 25–36. The paper is based on a lecture delivered at Brandeis University on 24 March 2004. ^ D’Acunto, Francesco, et al. "Distrust in Finance Lingers: Jewish Persecution and Households’ Investments." Haas School of Business. September 2014. 20 October 2014. ^ Mathis, Andrew E. Holocaust Denial, a Definition, The Holocaust History Project, 2 July 2004. Retrieved 16 May 2007. ^ Antisemitism and Racism Country Reports: United States, Stephen Roth Institute, 2000. Retrieved 17 May 2007. ^ a b Introduction: Denial as Anti-Semitism, "Holocaust Denial: An Online Guide to Exposing and Combating Anti-Semitic Propaganda", Anti-Defamation League, 2001. Retrieved 12 June 2007. ^ The Almohads. Myjewishlearning.com. Retrieved 2 June 2012. ^ Morris, Benny. 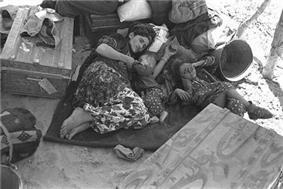 Righteous Victims: A History of the Zionist-Arab Conflict, 1881–2001. Vintage Books, 2001, pp. 10–11. ^ Why do human rights groups ignore Palestinians’ war of words?. Washingtonpost.com (26 September 2011). Retrieved 2 June 2012. ^ United States Holocaust Memorial Museum. "Nazis’ ‘Terrible Weapon,’ Aimed at Minds and Hearts", The New York Times, 23 February 2009. Retrieved 24 November 2010. ^ Neil J. Kressel. "The Urgent Need to Study Islamic Anti-Semitism", The Chronicle of Higher Education, The Chronicle Review, 12 March 2004. ^ Examples of anti-Semitism in the Arab and Muslim world on intelligence.org.il, site of the Intelligence and Terrorism Information Center at the Center for Special Studies (C.S.S), Israel. Retrieved 24 September 2006. ^ Anti-Semitism in the Egyptian Media: February 2001 – February 2002, "Classic Anti-Semitic Stereotypes", Anti-Defamation League. Retrieved 4 March 2007. ^ Hyphenation added by Fulford. ^ Bersih an opportunity for Jews to infiltrate country, says Utusan by Shannon Teoh, Malaysia Insider, 18 July 2011. ^ "Jews barred in Saudi tourist drive", BBC News, 27 February 2004. Retrieved 25 November 2010. ^ Morrison, JAmes. 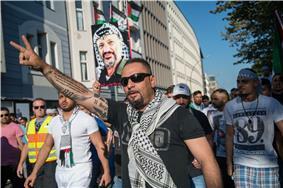 "Saudis invite Jews. ", The Washington Times, 1 March 2004. Retrieved 25 November 2010. ^ Whitaker, Brian. "Saudis deny anti-Jewish visa policy", The Guardian, 1 March 2004. Retrieved 25 November 2010. ^ "ADL Calls on Arab Leaders to Denounce Anti-Semitic Television Series", Anti-Defamation League, 10 December 2001. Retrieved 24 November 2010. ^ Shea, Nina. "This is a Saudi textbook. (After the intolerance was removed. )", The Washington Post, 21 May 2006, p. B01. ^ Press Release. freedomhouse.org. Retrieved 2 June 2012. ^ Tom Gross, "Living in a Bubble: The BBC’s very own Mideast foreign policy"., National Review, 18 June 2004. ^ The Economist faces barrage of accusations from the Turkish gov't, The Hurriyet Daily News (English language edition), 12 June 2011. ^ a b Anti-Semitism In Germany Today: Its Roots And Tendencies – Susanne Urban. Jcpa.org. Retrieved 2 June 2012. ^ Stephen Roth Institute, Tel Aviv University. ^ GENERAL ANALYSIS 2004, The Stephen Roth Institute for the Study of Contemporary Antisemitism and Racism, Tel Aviv University. Retrieved 29 March 2011. ^ Krieger, Leila Hilary. "Rothschild: France not anti-Semitic". The Jerusalem Post, 15 June 2006/ Archived 5 June 2008 at the Wayback Machine. ^ Berkhout, Karel. (26 January 2010) "Anti-Semitism on the rise in Amsterdam". Nrc.nl. Retrieved on 2012-06-01. ^ Hets av jøder er økende i Europa – Aftenposten. Aftenposten.no. Retrieved 2 June 2012. ^ Jews flee Malmö as anti-Semitism grows by David Landes, The Local, 27 January 2010. ^ a b Donald Snyder. For Jews, Swedish City Is a ‘Place To Move Away From’. Forward.com (7 July 2010). Retrieved 2 June 2012. ^ Report: Anti-Semitic attacks rising in Scandinavia, Jewish Telegraphic Agency (JTA), 22 March 2010. ^ For Jews, Swedish City Is a ‘Place To Move Away From’ by Donald Snyder, The Forward, Published 7 July 2010, issue of 16 July 2010.). ^ Report of the All-Party Parliamentary Inquiry into Antisemitism PDF (430 KB), All-Party Parliamentary Group against Antisemitism, September 2006. Retrieved 24 November 2010. For the first and second quote, see summary; for the third quote, see p. 17. Archived 24 November 2010. ^ Antony Lerman, "Antisemitism Research Just Improved: Yale’s ‘Initiative’ for Studying Antisemitism is Axed", Antony Lerman: Context Is Everything, 10 June 2011. Retrieved 13 June 2011. ^ ADL Survey: American Attitudes Towards Jews in America. Adl.org. Retrieved 2 June 2012. ^ Neil Malhotra and Yotam Margalit. 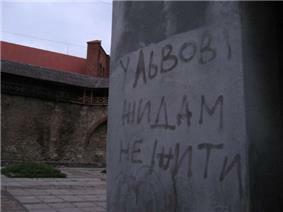 State of the Nation: Anti-Semitism and the economic crisis. Boston Review. Retrieved 2 June 2012. ^ Includes English translation of Venezuelan National Radio article. In the 21st century, the dominant source of contemporary antisemitism in the UK is the far right. Although in the aftermath of the Holocaust far right extremism became marginalised, Holocaust denial and Jewish conspiracy theories remain core elements of far right ideology. Nevertheless, contemporary antisemitism is to be found as well on the left of the political spectrum. Criticism of Israel, especially from the left, has been fueled further by the second Palestinian Intifada and by the invasion of Iraq in 2003. A report released in 2012 by the Community Security Trust, documenting antisemitic incidents from January–June 2012, revealed that the number of incidents rose in these months compared to incidents in 2011, with 299 cases deemed antisemitic. There was a significant rise in the number of antisemitic incidents in March 2012, apparently influenced by the antisemitic terrorist attack in Toulouse, France during that month by Mohammed Merah. In 2005, a group of British Members of Parliament set up an inquiry into antisemitism, which published its findings in 2006. Its report stated that "until recently, the prevailing opinion both within the Jewish community and beyond [had been] that antisemitism had receded to the point that it existed only on the margins of society." It found a reversal of this progress since 2000. In his oral evidence, the Chief Rabbi stated: "If you were to ask me is Britain an antisemitic society, the answer is manifestly and obviously no. It is one of the least antisemitic societies in the world." The inquiry set out to investigate the problem, identify the sources of contemporary antisemitism and make recommendations to improve the situation. It discussed the influence of the Israel-Palestine conflict and issues of anti-Israel sentiment versus antisemitism at length and noted "most of those who gave evidence were at pains to explain that criticism of Israel is not to be regarded in itself as antisemitic... The Israeli government itself may, at times, have mistakenly perceived criticism of its policies and actions to be motivated by antisemitism." In November 2010, the BBC's investigative program Panorama reported that Saudi national textbooks advocating antisemitism were being used in Islamic religious programs attended by 5,000 British schoolchildren in the United Kingdom. In the textbooks, Jews were described as looking like monkeys and pigs. 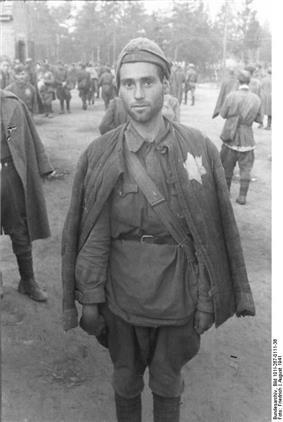 Ukrainian Insurgent Army (UPA), and the 14th Waffen-SS Galicia Division." In early 2010, the Swedish publication The Local published series of articles about the growing antisemitism in Simon Wiesenthal Center issued a travel advisory concerning Sweden, advising Jews to express "extreme caution" when visiting the southern parts of the country due to an alleged increase in verbal and physical harassment of Jewish citizens in the city of Malmö. Ilmar Reepalu, the mayor of Malmö for over 15 years, has been accused of failing to protect the Jewish community in Malmö, causing 30 Jewish families to leave the city in 2010, and more preparing to leave, which has left the possibility that Malmö's Jewish community will disappear soon. Critics of Reepalu say that his statements, such as antisemitism in Malmö actually being an "understandable" consequence of Israeli policy in the Middle East, have encouraged young Muslims to abuse and harass the Jewish community. In an interview with the Sunday Telegraph in February 2010, Reepalu said, "There haven't been any attacks on Jewish people, and if Jews from the city want to move to Israel that is not a matter for Malmö," which renewed concerns about Reepalu. According to the Anne Frank Foundation, antisemitism in the Netherlands in 2011 was roughly at the same level as in 2010. Actual antisemitic incidents increased from 19 in 2010 to 30 in 2011. Verbal antisemitic incidents dropped slightly from 1173 in 2010 to 1098 in 2011. This accouns for 75%-80% of all verbal racist incidents in the Netherlands. antisemitism is more prevalent in the age group 23–27 years, which is a younger group than that of racist incidents in general. The BBC aired a Panorama episode, entitled A Question of Leadership, which reported that Abdul Rahman Al-Sudais, the leading imam of the Grand mosque located in the Islamic holy city of Mecca, Saudi Arabia, referred to Jews as "the scum of the human race" and "offspring of apes and pigs". Al-Sudais further stated: "the worst [...] of the enemies of Islam are those [...] whom he [...] made monkeys and pigs, the aggressive Jews and oppressive Zionists and those that follow them [...] Monkeys and pigs and worshippers of false Gods who are the Jews and the Zionists." In another sermon, on 19 April 2002, he declared that Jews are "evil offspring, infidels, distorters of [others'] words, calf-worshippers, prophet-murderers, prophecy-deniers [...] the scum of the human race whom Allah cursed and turned into apes and pigs [...]"
The Center for Religious Freedom of Freedom House analyzed a set of Saudi Ministry of Education textbooks in Islamic studies courses for elementary and secondary school students. The researchers found statements promoting hatred of Christians, Jews, "polytheists" and other "unbelievers," including non-Wahabi Muslims. The Protocols of the Elders of Zion was taught as historical fact. The texts described Jews and Christians as enemies of Muslim believers and the clash between them as an ongoing fight that will end in victory over the Jews. 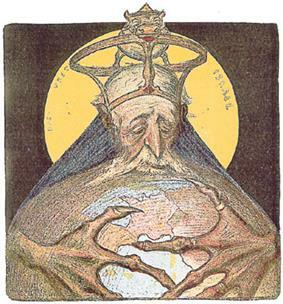 Jews were blamed for virtually all the "subversion" and wars of the modern world. A 38-page overview PDF (371 KB) of Saudi Arabia's curriculum has been released to the press by the Hudson Institute. Saudi textbooks vilify Jews (and Christians and non-Wahabi Muslims): according to 21 May 2006 issue of The Washington Post, Saudi textbooks claimed by them to have been sanitized of antisemitism still call Jews apes (and Christians swine); demand that students avoid and not befriend Jews; claim that Jews worship the devil; and encourage Muslims to engage in Jihad to vanquish Jews. In 2001, Arab Radio and Television of Saudi Arabia produced a 30-part television miniseries entitled "Horseman Without a Horse", a dramatization of The Protocols of the Elders of Zion. One Saudi Arabian government newspaper suggested that hatred of all Jews is justifiable. The website of the Saudi Arabian Supreme Commission for Tourism initially stated that Jews would not be granted tourist visas to enter the country. The Saudi embassy in the U.S. distanced itself from the statement, which was later removed. A substantial number of people in Pakistan believe that the 11 September 2001 attacks on the World Trade Center in New York were a secret Jewish conspiracy organized by Israel's MOSSAD, as were the 7 July 2005 London bombings, allegedly perpetrated by Jews in order to discredit Muslims. Such allegations echo traditional antisemitic theories. The Jewish religious movement of Chabad Lubavich had an mission house in Mumbai, India that was attacked in the 2008 Mumbai attacks, perpetrated by militants connected to Pakistan led by Ajmal Kasab. Antisemitic intents were evident from the testimonies of Kasab following his arrest and trial. Mudar Zahran, a Palestinian, writing for the Gatestone Institute says that "the Palestinians have been used as fuel for the new form of anti-Semitism; this has hurt the Palestinians and exposed them to unprecedented and purposely media-ignored abuse by Arab governments, including some of those who claim love for the Palestinians, yet in fact only bare hatred to Jews. This has resulted in Palestinian cries for justice, equality, freedom and even basic human rights being ignored while the world getting consumed with delegitimizing Israel from either ignorance or malice." Haj Amin al-Husseini meeting with Adolf Hitler, December 1941. 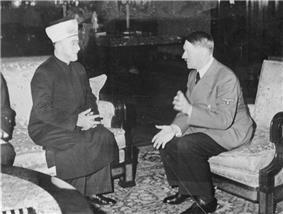 The Grand Mufti of Jerusalem helped recruit Muslims for the Waffen-SS. Dean Phillip Bell documents and enumerates a number of categories and causes for anti-Jewish sentiment. He describes political, social, and pseudo-scientific efforts to separate Jews from "civil" society and notes that antisemitism was part of a larger attempt to differentiate status based on racial background. Bell writes, "Socio-psychological explanations focus on concepts of projected guilt and displaced aggression, the search for a scapegoat. Ethnic explanations associated marginalization, or negative representation of the Other, with perceived ethnic differences. Xenophobia ascribes anti-Jewish sentiment to broader concern over minority groups within a national or regional identity. In 1965 Pope Paul VI issued a papal decree disbanding the cult of Simon of Trent, the shrine erected to him was dismantled, and Simon was decanonized. After the war, the Kielce pogrom and "March 1968 events" in communist Poland represented further incidents of antisemitism in Europe. The anti-Jewish violence in postwar Poland has a common theme of blood-libel rumours. Antisemitism was commonly used as an instrument for personal conflicts in the Soviet Union, starting from conflict between Joseph Stalin and Leon Trotsky and continuing through numerous conspiracy-theories spread by official propaganda. Antisemitism in the USSR reached new heights after 1948 during the campaign against the "rootless cosmopolitan" (euphemism for "Jew") in which numerous Yiddish-language poets, writers, painters and sculptors were killed or arrested. This culminated in the so-called Doctors' Plot (1952–1953). Similar antisemitic propaganda in Poland resulted in the flight of Polish Jewish survivors from the country. In Germany, Nazism led Adolf Hitler and the Nazi Party, who came to power on 30 January 1933, instituted repressive legislation denying the Jews basic civil rights. In 1935, the Nuremberg Laws prohibited sexual relations and marriages between "Aryans" and Jews as Rassenschande ("race disgrace") and stripped all German Jews, even quarter- and half-Jews, from their citizenship, (their official title became "subjects of the state"). It instituted a pogrom on the night of 9–10 November 1938, dubbed Kristallnacht, in which Jews were killed, their property destroyed and their synagogues torched. Antisemitic laws, agitation and propaganda were extended to German-occupied Europe in the wake of conquest, often building on local antisemitic traditions. In the east the Third Reich forced Jews into ghettos in Warsaw, Kraków, Lvov, Lublin and Radom. 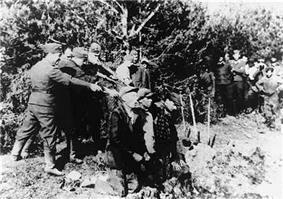 After the invasion of the Soviet Union in 1941 a campaign of mass murder, conducted by the Einsatzgruppen, culminated from 1942 to 1945 in systematic genocide: the Holocaust. 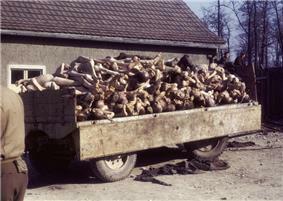 Eleven million Jews were targeted for extermination by the Nazis, and some six million were eventually killed.